Not receiving our useful study tips but would like to? Or perhaps you want to put them on hold? Here's how to manage your preferences. If you opt-in to receive our newsletter, you can expect to receive information to help you get the most from our service, plu useful study tips in your inbox on a fortnightly basis, as well as ad hoc invitations to participate in research surveys that will help us improve our service. Most of the surveys are incentivised, which means you could earn vouchers or win cool prizes too. We run all of this ourselves so we promise your information won't be shared with anyone externally without your individual permission. If you're missing out on our newsletter and would like to sign up, go to your 'account details' page in your account, and tick the box at the bottom of the page. 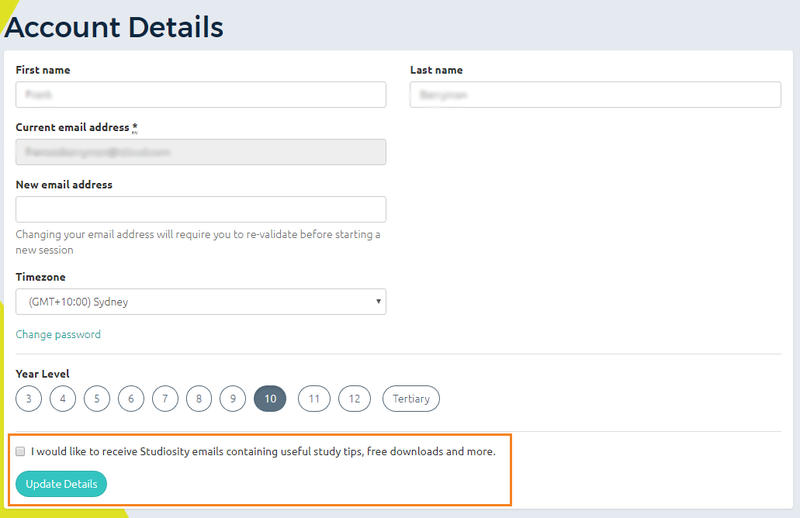 To put your emails on hold, either click 'unsubscribe' at the bottom of the email when it comes into your inbox, or make sure the box shown above is unchecked.